PlayStation VR has been hit with a lot of titles since its launch, but not all of them are created equal. Many of them are billed as "experiences" which usually means they're short or not very interactive. Unearthing Mars is one of these types of games, but it comes with Move support and an intriguing premise. Are these things enough to make it worth the price of entry? In digging up Mars, did we strike buried treasure, or should we leave this one buried? Join me as we find out! Mission to Mars: A Missing Moon? The premise of Unearthing Mars is certainly intriguing. 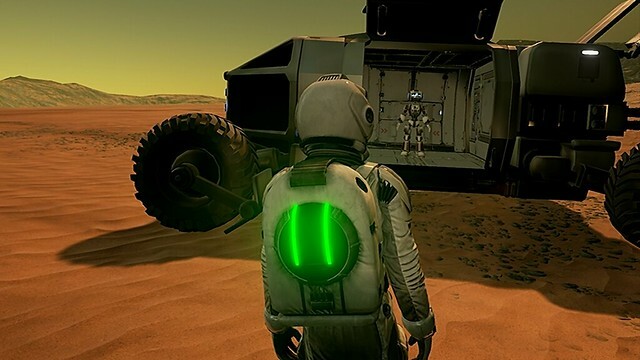 You play as a member of a 3-person crew that has come to mars sometime in the future to investigate the loss of its moon, Phobos, which has collided with the planet. In the game, you'll spend some time in a variety of different areas, ranging from a main ship, to a shuttle cockpit, to the surface of mars, caves, and a few other surprises. The story when taken as a whole is pretty cool. Unfortunately, it falls a little short. Yes, the game is only about 2-hours, but the developers tell you that in the store page, and it's priced at $15 so you know what you're getting. The problem here isn't length, it's the fact that the writing and voice acting are very basic and in the case of the acting, it just never comes across as something you can take seriously. The humans are decent at times, but their robot companion, Charlie-13, is borderline annoying to listen to. That being said, if you can get past the voice acting and the surface level writing, you won't really care about the characters too much, but you'll have a good time with the story. And honestly, I saw that because the story only really got good at about the halfway mark. The last several chapters ramped up the interest and a climactic finale left me pleased with the story as a whole. Up until that halfway point, however, the story didn't move very quickly and it wasn't extremely exciting. It had some action, but the characters never really said anything meaningful to each other. Furthermore, the main character is just called "co-pilot" with no real name to speak of throughout the experience. While I know there's people who will complain about a 2-hour story, plenty of games have done it and been wildly successful. It's not about length if the price is right. It's about what they do with the time they have. While Unearthing Mars ends up being a pretty cool tale, it's marred by the writing and acting. I hate to use a cliche', but Unearthing Mars fits it pretty well. The game uses 2 Move controllers to offer a wide range of experiences as you're playing. Point-and-click exploration, some basic interactions with the environment, driving, puzzle solving, and even some shooting are all on the menu here. It sounds amazing, and there's certainly moments where it can be really cool, but the game never goes beyond the surface of these mechanics. Let's explore some examples. There's a scene with a shuttle where you need to help the commander land it. Awesome, let's pull levers, flip switches, maybe steer? No, not really. You'll do a few interactions, but they all lack immediacy and at the end of the day you're not the one driving. Okay, so what about the driving? It's cool because you get to steer with the move controllers, but the camera doesn't follow the car. You have to hit a button to warp to it. Worse, there's not really much to do but drive across the landscapes. They're big and the sense of scale is absolutely realized in VR, but they don't have much going on. Point-and-click gameplay works, but again, there's only one real place where they want you to go. All the other movement options just take you around the area for no real reason. Puzzle solving is certainly cool. There's some variety to each of them and using the Move controllers gives you great immersion. Of course, the shooting is also excellent, but only lasts for a short time. It all come together into this experience that's not bad, but it's not anywhere near as great as it could have been. All of the ideas are sound foundations, but they don't have any depth to them. I did encounter one situation where a character walked into me, causing my screen to go black and inform me that the player character was inside an object. The problem? The character who collided with me wouldn't move. It was a game-breaking glitch. I assume such a situation is rare, but I thought it worth mentioning. The presentation on Unearthing Mars is something that would have been impressive at launch for the PlayStation VR. Unfortunately, we've had plenty of games on PS4 and PS4 Pro that have provided more detail and a clearer picture. As it stands, the graphics in Unearthing Mars come across blurry, especially when looking into the distance. A few environments look really nice, but for the most part, it feels like something we would have seen at launch. For $14.99, I can't tell you to rush out and buy Unearthing Mars. If you're really in the mood for something new, or if you see it on sale, maybe give it a try. It has some cool ideas, but it's not something you'll play more than once. A copy of Unearthing Mars was provided to PS4 Experts for review purposes.